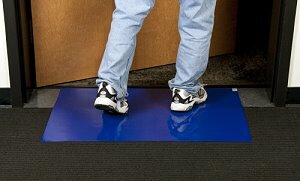 Sticky Mats have a tacky surface that can help protect against the contamination of clean areas. Place a pack of 30 of these mats on floors outside entrances into these areas to prevent tracking in dirt and other contaminants on the bottoms of shoes. As the top mat becomes dirty, it is simply peeled away to expose the next mat and discarded. A tacky surface on the bottom of the pack also keeps the pack securely in place.